The book for this week comes from our local PTO. 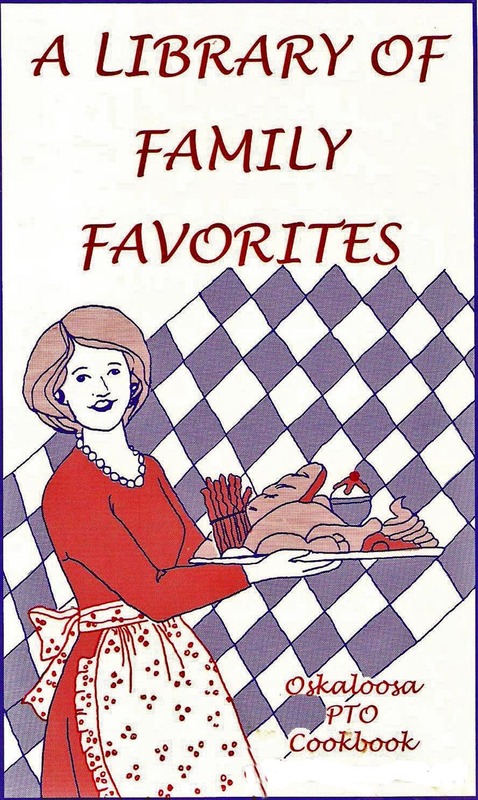 Called A Library of Family Favorites it was put out in 1999 to raise money to replace a budget cut to the elementary schools. The budget cut was restored so the proceeds were pledged to the purchase of library books for the school library. Over 2000 recipes were submitted. With this amount of recipes they had to omit several to keep the book to one volume. There are still an amazing amount of recipes for a book of this type. 506 pages of recipes and then the index. If you enjoy this type of cookbook, (church, town) this is one of the better books. Bettie’s boss and our lawyer’s wife was then president of the PTO and this book was a gift from her. She now serves on the school board. As they have 4 teenagers in school it gives them a strong interest in the school system. Of course, I have used the book to make things that can be shared with the Law Office where Bettie works and with other friends. I hope that you will enjoy trying some of the recipes. I love these types of little cookbooks, put out by Churches, clubs, just all sorts of groups. It is like peeking into the kitchens of all the folks you know as neighbors and friends. It is a wonderful way of sharing. Thank you for sharing too!! Hi, it's your cookbook loving friend Lisa!!! I just looked online and not one copy of this cookbook was found. Maybe not many copies were produced back then or everyone is hanging onto their copy. I don't know. Thank you for a wonderful blog!!! This was, as many of this type are, very local and I don't think it had a large press run. If you do find one it is a good book but most of the recipes will be in any standard cookbook of the type. Thank you! I will keep looking!